The festivities take place in the Montgomery County Courthouse Square in Mount Ida. “Our 4-Hers are in charge of the show, which is a significant fund-raiser for our youth development activities,” said Brad McGinley, Montgomery County Extension staff chair for the University of Arkansas System Division of Agriculture. McGinley said about about 40 club members lend their hands to the effort. 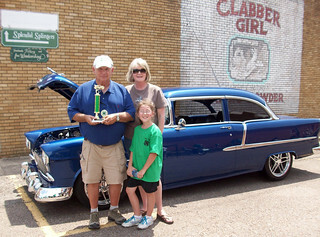 The show usually attracts about 100 entries from around the region. The show has nearly two dozen divisions covering cars dating from before 1949 to those in the 2014 model year. There are also divisions for muscle cars, street rods, antique motorcycles, trucks, Jeeps, Corvettes, and even one for best fixer-upper. “The antique motorcycles are always a big attraction,” McGinley said. 4-H members will also be on hand to help hand out the trophies. Registration is $20 per vehicle and entries may check in between 8 a.m.-10 a.m. on the day of the show. Winners will be announced at 2 p.m. The first 100 entries get free T-shirts. For more information about the show, contact the Montgomery County Extension Office at 870-867-2311.